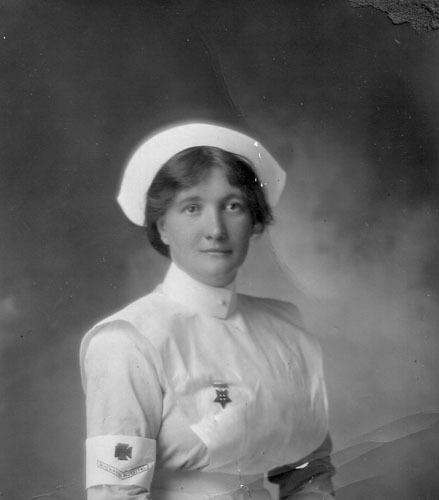 Mary Anne Reidy enlisted in the New Zealand Army Nursing Service in 1916 and served as a nursing sister during the First World War. Sr Reidy was our Grandmother's(Minnie Frawley nee Reidy) first cousin and they travelled out from Ireland together.Mary's mother had died and her dad wanted her to have a female companion on the journey so her father asked his sister and brother in law if their eldest daughter would travel to NZ with them. That's why we are all NZer's now. Our family were very proud of her great acheivements. this photo is very similar to a painting of a WW1 nurse by a famous painter of ww1. I wonder what ever happened to the M.B.E. ?